Super Brain Putty puts the brains into slime. This incredible Swiss compound is super safe, super versatile, and super fun. Bounce it, sculpt it, stretch it, pull it and melt it—Super Brain Putty never dries out, so the fun never ends! You can use it to print shapes, snap it into pieces, and form it into any shape you can imagine. Squeeze it like a stress ball or stretch it like a rubber band—Super Brain Putty can do it all. It slowly melts like ice, and can even bounce like a basketball! 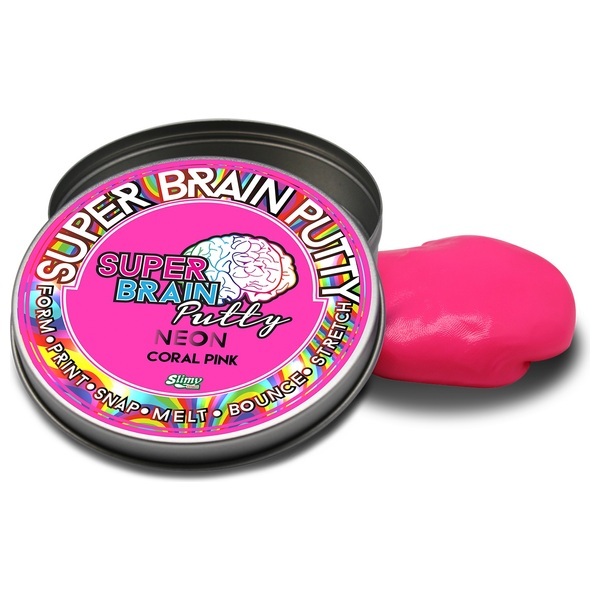 Super Brain Putty is cool and smooth, slippery and slimy, but doesn’t leave any residue on skin. Advanced slime technology offers endless hours of gloopy fun. The new Swiss formula of the Super Brain Putty Neon Series 5 puts safety first. This non-toxic and non-irritating compound is hypoallergenic and 100% gluten free. The putty comes neatly packaged in a tin, which is perfect for storing your slime between gooey games. The Super Brain Putty Neon Series 5 comes in 5 awesome colours: Brilliant Ornge, Sunburst Yellow, Chameleon Green, Turquoise Blue and Coral Pink. Collect them all for a slimy neon rainbow! Helpful Hints: Do not let Super Brian Putty come in contact with clothing or surfaces. Putty must be put back in its container after use.